Disney World has the best fireworks shows in the world! 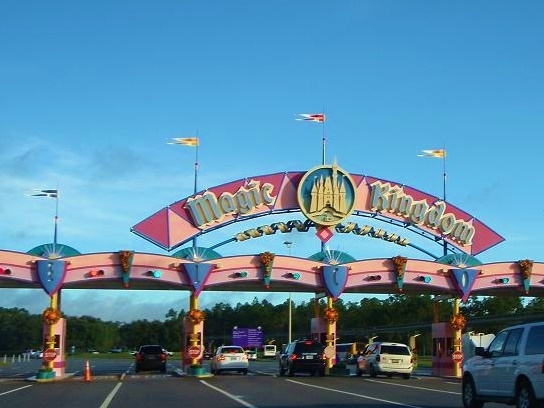 Walt Disney World in Orlando, Florida is the highest consumer of fireworks in the world. That means it costs at least $15 million a year for Magic Kingdom fireworks alone. Disney World puts on about 2,500 firework shows a year at three of their parks (Magic Kingdom, Epcot, and Disney’s Hollywood Studios). No fireworks displays are ever used Disney’s Animal Kingdom – it would scare the animals! And, there are no fireworks shows at Disney Springs. If you want to assume that Illuminations at Epcot and Fantasmic! at Disney’s Hollywood Studios are slightly less, maybe half the cost, that comes out to at least $30 million a year for them. This would not include any of the special fireworks displays that happen for 4th of July, Mickey’s Not So Scary Halloween Party, Villains in the Sky at Disney’s Hollywood Studios, Mickey’s Very Merry Christmas Party, nor the daytime fireworks that are a part of the stage shows performed in front of the Cinderella Castle at the Magic Kingdom throughout the day. We love the new fireworks show! A rough, conservative estimate for WDW fireworks: $45 – $50 million dollars annually. It seems like every time Disney changes or expands the fireworks show, the parking fees go up! Rumor has it that Disney uses the revenue from all their parking lots (currently $25/day ) to help cover the cost of the fireworks. So, when you pay for parking, you’re really paying for the evening’s fireworks show. Be sure to stay for the fireworks and not leave early. Your parking pass paid for that show! Disney recently added a new Star Wars-themed fireworks show at Disney’s Hollywood Studios. We’ve seen it a few times in front of the Chinese Theater and it’s pretty cool. Star Wars Fireworks. I wish I might have my wish tonight. 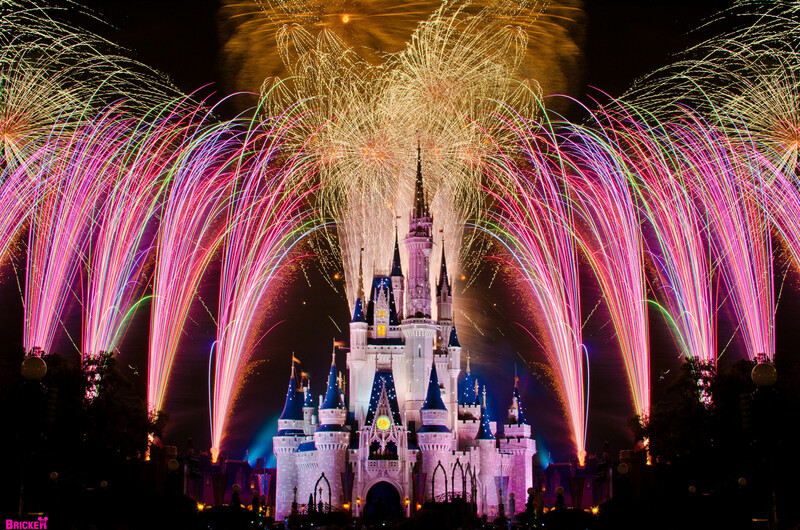 ‘Happily Ever After’ captures the heart, humor, and emotions of Disney films through awe-inspiring fireworks, state of the art projections, and brilliant lasers. Always make a wish when Tinkerbell leaps off the Cinderella Castle and glides over Fantasyland! This is Tinkerbell’s view of Tomorrowland from the turret where she jumps off the Castle every night before the start of the fireworks show. It’s a longggg way down! Nightly fireworks at Epcot: IllumiNations is Leaving September 30th! The new, temporary fireworks show called Epcot Forever will debut at 9pm on October 1, 2019. The official replacement for IllumiNations, yet unnamed, will debut in early 2020 and will feature massive floating set pieces, custom-built LED panels, choreographed fountains, lights, pyrotechnics, and lasers. The yet-unnamed show will celebrate how Disney music inspires people around the world. 5pm: Moving the Illumnations fireworks platforms into position. Moving out into the center of the Friendship Lagoon. April 16, 2019: Disney Parks gave a construction update Tuesday on the new gondola system, which is in testing stage. All but one gondola is currently covered in plastic. They will gradually be unveiled starting in mid-May to show off eight bright colors and 22 Disney characters themes. Running on more than six miles of cable, the gondolas will travel at about 11 mph, giving guests a bird’s eye view of Walt Disney World Resort’s lakes, roads, woods, and Epcot and Disney’s Hollywood Studios parks. Exterior of decorated gondola cabin. The typical ride will last between five to 15 minutes as gondolas travel from 15 feet up to about 60 feet in the air. “There are fabulous property views from above,” said Thomas Mazloum, a Disney senior vice president who oversees transportation and resorts. The Disney Skyliner gondola system consists of 300 gondolas and will open to the public later this fall. The gondolas will carry enough Disney guests to roughly match the capacity of its monorail trains, company officials said. Hard, unpadded wooden benches inside. Inside a gondola, twin wooden benches can carry up to 10 people. The interior is wide enough to accommodate a wheelchair. “We have specifically designed them with the Florida climate in mind,” he said, pointing to reflective windows that block out the sunlight and the mesh screens on both sides to bring in a breeze. The gondolas will run at a brisk 11 mph. Some gondola cabins will be decorated in plain colors, like a vibrant teal or purple, while the other gondolas will feature characters from Disney movies and attractions. When we were there last month, we got to see the progress on the new Disney Skyliner gondola system, especially at Disney’s Hollywood Studios. A Disney Skyliner transfer station at Disney’s Hollywood Studios. Skip the parking hassle and take the gondola from your resort! The gondolas mostly ride about 25 feet above the ground. Gondola transfer station at DHS is ready. Cute Skyliner pins for resort guests! Free!!! Gondola tower by Caribbean Beach. Some guests have complained about how the towers look crossing the resorts. The map below shows how the two theme parks (Epcot and DHS) and four resorts (Caribbean Beach, Boardwalk Resort, and Pop Century/Art of Animation Resorts) will be connected. Outline of how the gondolas will connect the four resorts to the two parks. The yellow squares on the map feature the gondola stations/stops while the blue squares signify the L-turns to change direction. The orange lines detail the cable routes the gondola cars will travel. Disney Skyliner Transfer Station, loading/unloading area for guests. The Boardwalk Resort is just to the right on this photo. We’re most excited about the possibility of the Epcot France gondola connecting to Disney’s Boardwalk Resort! Epcot France on a lovely spring day. The new high speed gondola Skyliner transportation system will transport guests a good distance across the vast WDW property in under 15 minutes, a huge improvement over the current bus transportation system, which takes 45 minutes to over an hour during peak times to get between the four points. The gondolas will have great treetop views of the parks! The famous Rose Window stained glass window survived the fire. Since the terrible fire at Notre-Dame two days, over $1.1 Billion Dollars has been pledged towards the 5-year massive rebuilding effort. Walt Disney so loved the iconic spire at Notre-Dame Cathedral that he added it to Sleeping Beauty Castle. Sleeping Beauty Castle at Disneyland. The spire is on the right. Close up of the spire. I took this photo on our last trip to Disneyland. On all our trips to Disneyland, we never noticed it either!! Monday, April 15, 2019: The spire topples during the fire. The sacred relics are saved. About noon on Monday afternoon MDT, watching with the world as the great cathedral burned. Disney released their animated version of The Hunchback of Notre Dame in June 1996. April 15, 2019: This drawing went viral as the great cathedral was burning. The new Ratatouille ride is to the left of the Eiffel Tower. We’ve had several people ask us about how construction is coming along on the new Ratatouille ride at the Epcot France Pavilion. April 2019: The ride’s walls are up. Ratatouille Ride entrance at Disneyland Paris. Coming to the France pavilion in Epcot’s World Showcase in 2020, the new ride will be based on the popular Disneyland Paris attraction. That 4D ride shrinks visitors down to the size of Remy, the gourmet chef who happens to be a rat, and sends them on an adventure using sophisticated trackless vehicles. The Ratatouille Ride. We’re looking forward to this 2020 Epcot update the most! We are hoping that Disney plans on adding this fabulous Ratatouille Fountain to the Epcot France ride’s entrance too. Close-up of the Ratatouille Fountain at Disneyland Paris. Sadly, last month a Construction Worker Killed at Epcot France in a fall inside the attraction. I think the Scarlet Macaw is one of the most beautiful birds! We try and do something new and different on every trip to Disney World. Last month, we were lucky to catch the Winged Encounters bird show at Disney’s Animal Kingdom. We had never seen it before. The short 5-minute show focuses on macaws and bird conservation. The birds fly in (and out) while avian experts tell interesting facts about them. The Blue and Yellow Macaw. They fly over the crowd to their feeding station which is loaded with unsalted peanuts. Each show is unique and uses different birds. Our show had 5 different kinds of macaws in it, about 25 birds! The featured macaws are hyacinth, green-winged, blue and gold, scarlet, military and blue-throated. The Hyacinth Macaw is now extinct in the wild. 😦 That was the bird that starred in the animated movie, “Rio”. You can see the 10:30am show, then see a show with completely different birds at 1:30pm! They fly right over your head. Watch in wonder as the winged stars of the show take off near the Tree of Life. Like a living kaleidoscope, the brilliantly colored birds swoop and soar over Discovery Island. Keep your peepers peeled for appearances by 6 species of South American macaw: hyacinth, green-winged, blue and gold, scarlet, blue-throated and military. The largest have an incredible wingspan of around 48 inches. Gather around as our resident bird care experts unlock the secrets of these fascinating creatures—and even answer questions from the audience. It’s the ultimate bird-watching experience! These birds are very well trained and very healthy. Sitting on the Tree of Life carvings. Meeting DiVine at Disney’s Animal Kingdom – She is One Cool Plant!!! Caroline meeting DiVine at Disney’s Animal Kingdom. Hands down, one of the coolest characters at Disney’s Animal Kingdom is DiVine. When Caroline was working at DAK, she would see her on most days, usually between 10am – 2pm, slowly walking on the pathway between Discovery Island and Africa. Hello…..she’s so pretty…all covered in grape clusters!! 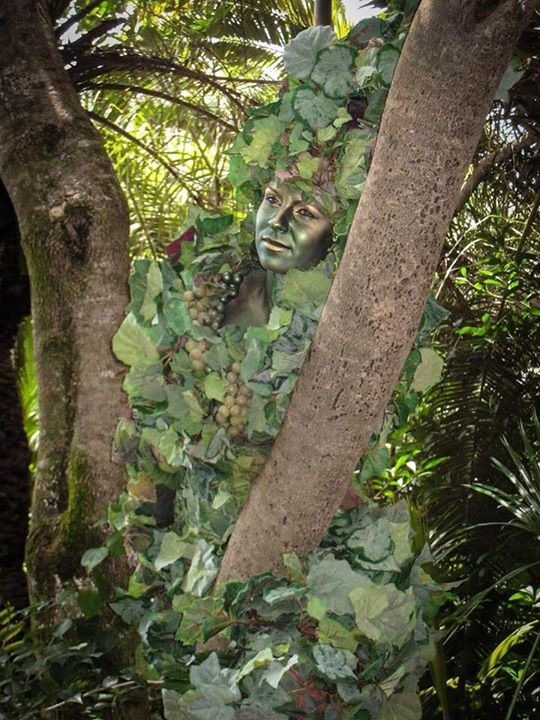 She’s painted a deep green, walks on stilts, and is wrapped in leaves, ivy, and grape clusters to camouflage herself into the rest of the park’s tropical foliage. So cool! She’s almost 7 feet tall! DiVIne walks on stilts so her height can vary between 7 feet to 16 feet depending on what she is doing with her arms and legs. If you’re lucky, you might catch a peek of DiVine walking around DAK around lunchtime. DiVine slowly walking around the park. She also doesn’t sign autographs (take a look at her hands in the video below), but loves to pose for photos. So cool! Moving from tree to tree. Close-up photo of her beauty. DiVine is so pretty! Hands down, we think she’s one of the coolest characters at Disney’s Animal Kingdom. She’s hard to see when she’s not moving and her eyes are closed! Note: DiVine has a cast member character handler with her at all times now after some guests got too close and grabbed at her leaves and tried to topple her!!! You know how tall this sign is! Guests can celebrate Earth Day 2019 by participating in ‘Party for the Planet’ activities at Disney’s Animal Kingdom, April 20 – April 22, 2019. Earth Day is on April 22, 2019. 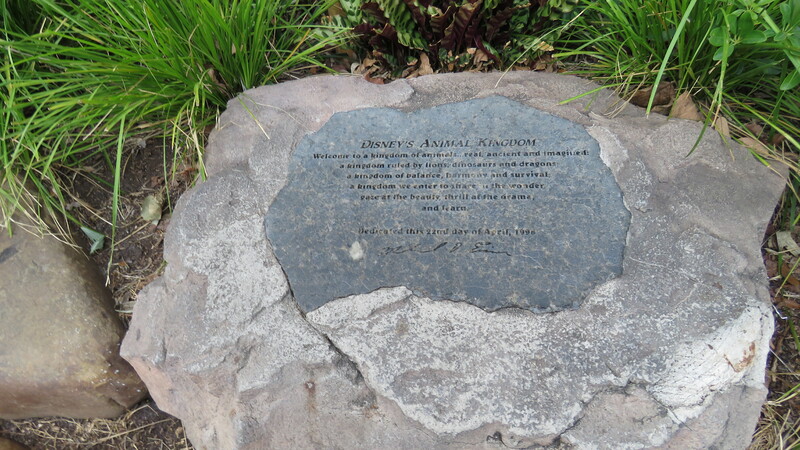 DAK’s Dedication Rock, April 22, 1998. Do you know where this rock is at DAK? FYI: Disney’s Animal Kingdom opened 21 years ago on Earth Day, April 22, 1998. 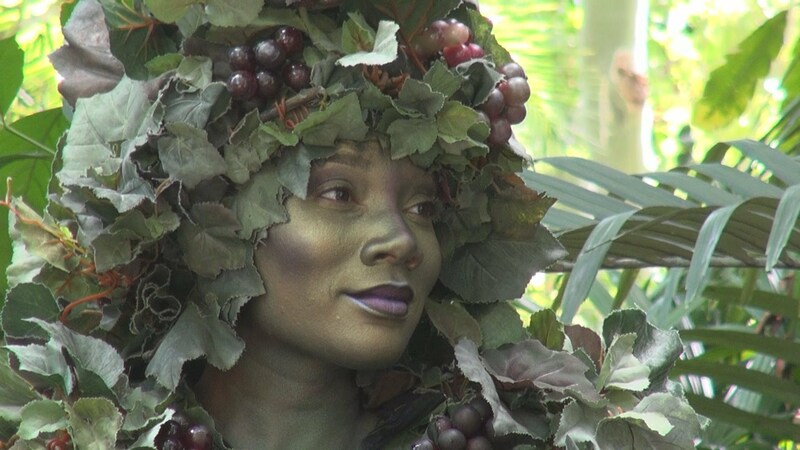 Party for the Planet is a fun and festive way to connect with nature and be inspired to protect our planet through a variety of special offerings at Disney’s Animal Kingdom, including opportunities to explore the nature and wildlife of the park. Art to Save the Sea: See the Adélie penguin and her baby sculpture resting on a pebble nest. The installation is more than initially meets the eye – it’s made entirely out of recycled marine debris such as bottle caps, toothbrushes and even discarded toys, all recovered from oceans and waterways! The artwork was created by the nonprofit organization WashedAshore.org. Tree of Life Cupcake, $5.99. Well worth it! Guests visiting during Earth Month 2019 can pick up a 2019 Party for the Planet Times Guide when entering the park to help plan your the day. While at the Oasis, guests can also select one of 10 different animal cut-outs and they are encouraged to take photos for sharing on social media using the hashtag #DisneyAnimals. Connect with nature and wildlife at this annual Earth Day – Earth Month event from April 1 – April 30, 2019. Watch the video here. A Special Welcome Celebration for Earth Month – See the festive kick-off for Party for the Planet on April 20th in front of the Tree of Life, featuring music, dancers and some of your favorite Disney Characters! 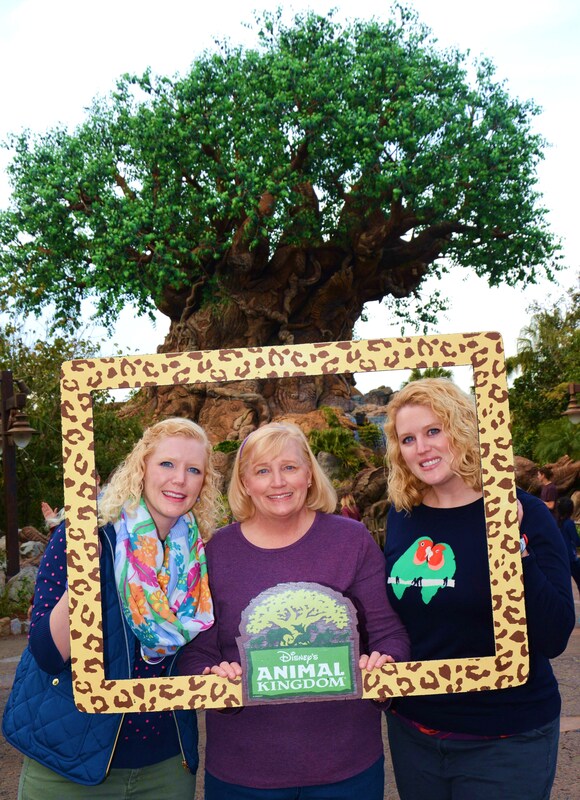 Exclusive Disney PhotoPass Opportunities ̶ Throughout the park, you’ll find Disney PhotoPass frames that are part of the “Reverse the Decline” campaign and highlight animals supported by the Disney Conservation Fund. Special Wilderness Explorers Badge Location ̶ Wilderness Explorers will have a special limited-time badge location helping Guests learn how to better connect with nature while on vacation―and once they return home. Plus, look for special merchandise, a special-edition lunch menu at Tiffins, themed treats throughout the park and new Penny Press designs celebrating the Disney Conversation Fund—all available for a limited time. Celebrating Earth Day with my Disney bff, Ricky. Kevin is out this month at Discovery Island!!! Jiminy Cricket only comes out on Earth Day weekend! 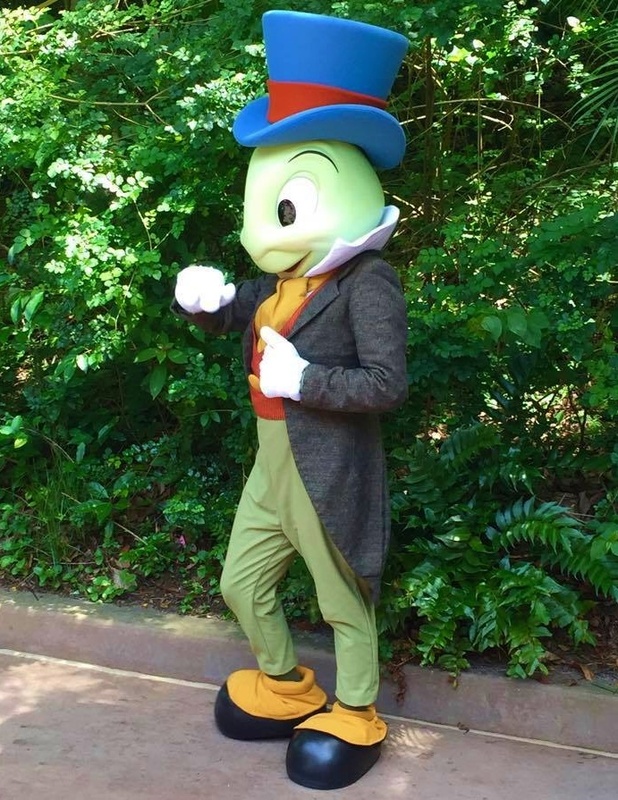 Jiminy Cricket at DAK last year. Caroline at the Tree of Life with her DCP Alumni Magic Band. DAK gift cards…made of real wood!!! If you’re lucky, you might catch a peak of DiVine walking around DAK! Final Note: DAK has been mobbed in the early mornings because of Pandora. It’s better to arrive at DAK mid- to late-morning, after 10am, to avoid long wait lines at the main entrance. Spring Break 2019: DAK entrance is mobbed with people waiting to get into Pandora. Throwback Thursday…Our first visit to Disney’s Animal Kingdom! Working together at Disney’s Animal Kingdom.